Sleep deprivation is a real thing, people. Holy smokes. I knew our little bundle of joy would change our lives in a big way, but getting motivated to do anything when you’re exhausted? It’s rough. I’ve always been a terrible sleeper. Between having a roommate and rowdy dorm mates, I didn’t sleep much for 4 years during college. Now I sleep with earplugs and a noisemaker, and the room has to be approximately 70 degrees or cooler. The tiniest noise will wake me up, sooo you can imagine that listening for every little peep from a newborn hasn’t exactly helped my situation. No sleep = no motivation to do things like cook huge homemade dinners or wash dishes. Coffee. Specifically, Folgers Instant Coffee. No sleep means coffee is definitely a necessity. It’s pretty much more important than oxygen at this point! This little red canister has been a lifesaver because it literally takes 2 minutes to make a cup of coffee. It requires microwaving a cup of water for 2 minutes, and then stirring in a spoonful of granules. Guess what? You can even do that with one hand! Brewing a pot of coffee takes way too long, and usually by the time it’s done brewing, I’ve gotten sucked into doing something else. Even if I manage to get a first cup, there’s no point really in making a whole pot because it’ll be cold by the time I get back around to it. 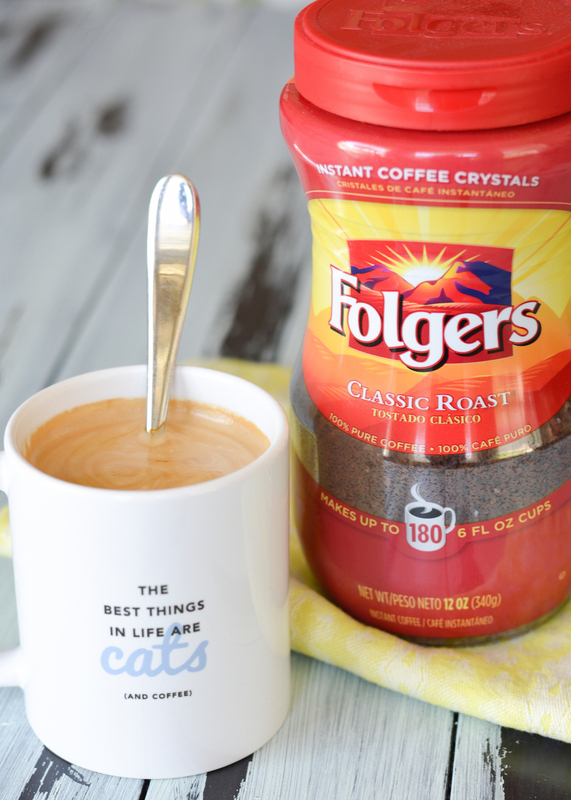 I love that you can easily make single cups of coffee with the Folgers instant coffee. Freezer meals! 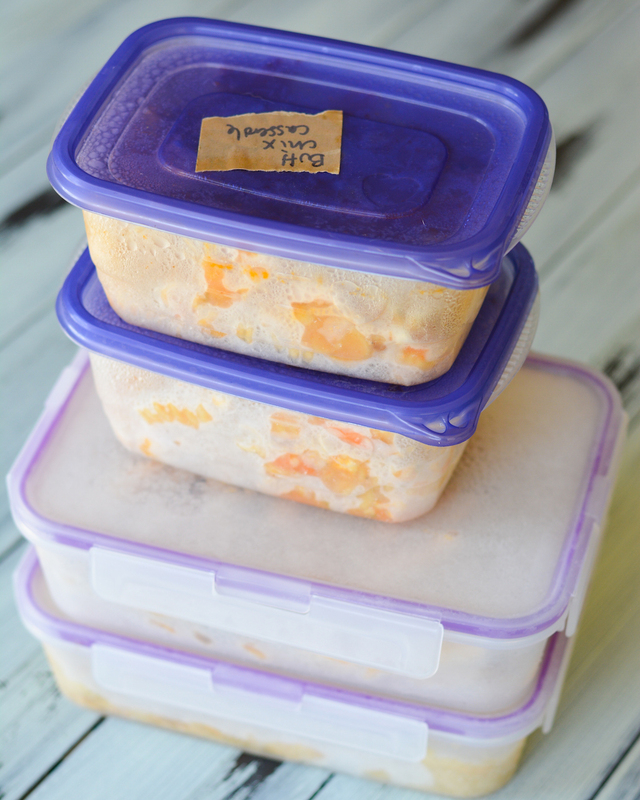 In my last few weeks of pregnancy, I was cooking up a storm and packing it all up in meal-sized containers for the freezer. It helped that Nick was out of town, so he wasn’t gobbling up all the food I was cooking. I am so glad I did this. The meals have lasted us weeks and it’s so easy to just grab a container, microwave it, and have dinner ready. These meals have also been great for packing Nick’s lunches. I don’t have to use up my precious few bits of energy on making sandwiches, and we’re not spending a ton of money on takeout food. Some of the meals I made for the freezer included: Buffalo Chicken Casserole, Southwestern Chili Con Queso Pasta Bake, Buffalo Chicken Chili and Honey Lime Chicken Enchiladas. They all make big batches and reheat really well. I also froze batches of Strawberry Banana Oatmeal Flax Muffins and Chocolate Chip Coconut Flour Banana Bread Muffins. These are great as easy breakfasts or snacks when we haven’t made it out to the grocery store in a while (which is definitely happening a lot). Lactation cookies. Speaking of freezing things, another thing I made a ton of before baby came was lactation cookies. 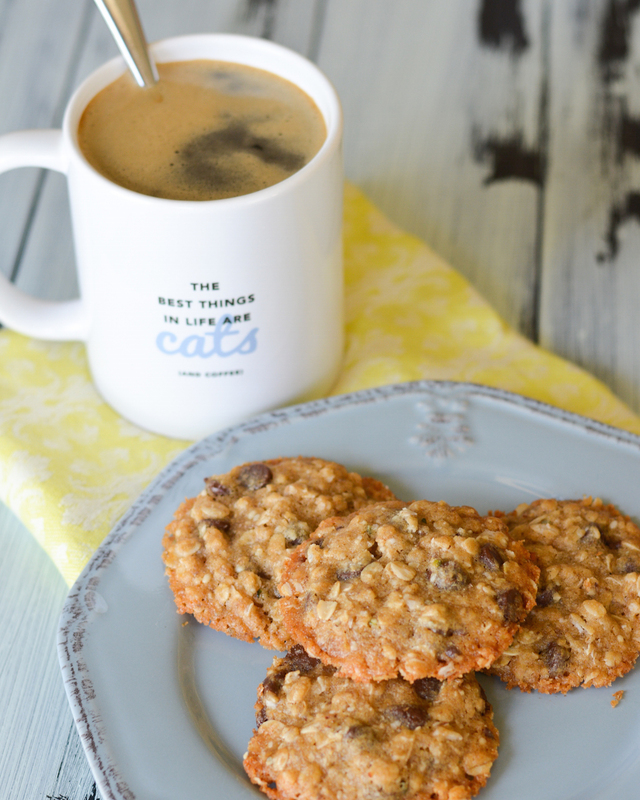 Specifically these Dairy-Free Lactation Cookies from my friend Natalie over at Tastes Lovely. These cookies are basically super-nutrient-dense little nuggets of heaven. They are packed with brewer’s yeast, flax and hemp seed, and oatmeal. All things that are really good for milk production. And good for you in general! When you’re not sleeping and not necessarily cooking a lot of fresh veggies, getting extra nutrients is really important. What’s really great about these cookies is that they’re easy. I won’t lie, these are my breakfast sometimes. And even my lunch. Or midnight snack. But they’re so easy to grab and eat, and because they’re packed with so much good for you stuff, I don’t feel bad about it! Plus, they are fantastic with a hot cup of coffee. And we know that there have been quite a few of those around these days. 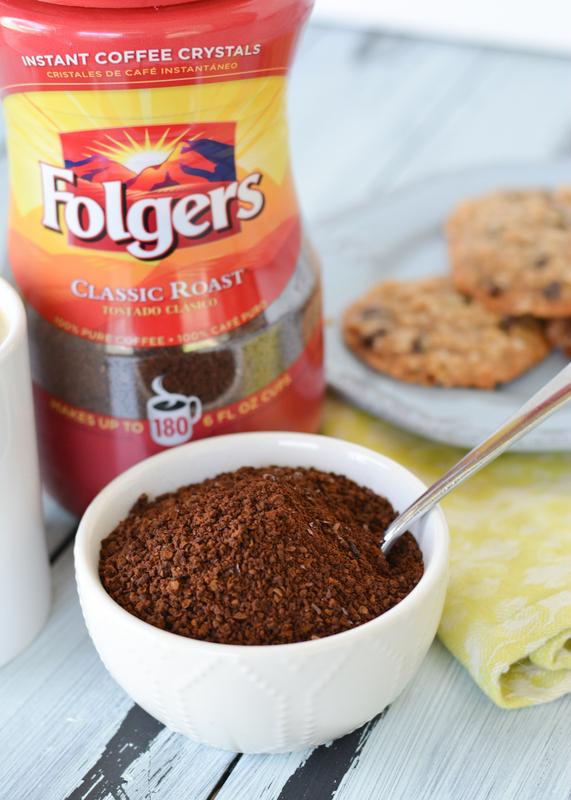 If you need some coffee inspiration, check out these delicious Folgers Recipes. And tell me: Do you have any other tips or tricks for me? I can use all the help I can get! Why We Love Living in California! Oh I remember it WELL! It feels like those first few sleep-deprived months crawl by, but you will miss them when they’re gone…not the sleep part though 🙂 It gets so much easier when they get a bit older and sleep for longer! 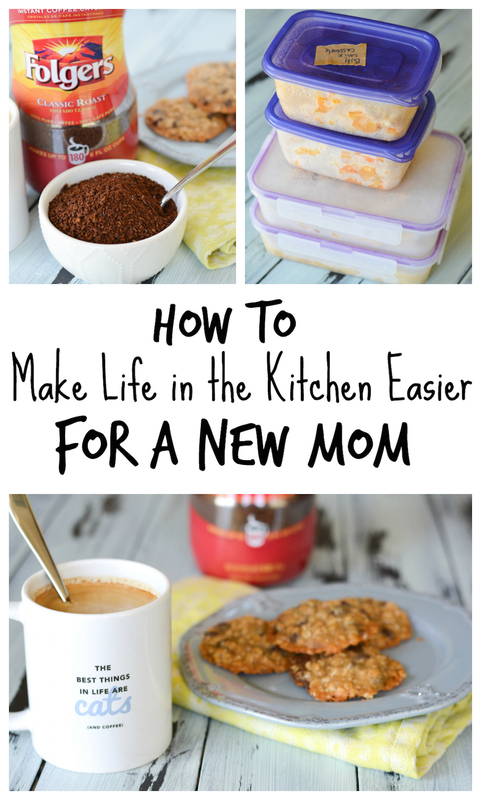 Love the looks of those lactation cookies, will have to make some (someday) when we decide to have another! This is so awesome, Jess! I will definitely remember this when I start having kids. What a crazy and exciting time for you!! I remember those early days, definitely lots of coffee needed (actually I still need it now and my littlest is 5) . I hate cold coffee too, instant is so great when you are busy!